Two things drew us to Honduras, the Mayan ruins at Copan and the diving on the bay islands in the north. The one thing we experienced that we hadn't planned for was a gun battle in San Pedro de Sula from which we needed the help of a kindly local to extract us in his jeep to safety. We went to Utila where the diving was said to be cheap and ended up staying for 10 days. Diving was £8 a shot which can't be beaten and we had some fantastic experiences seeing some really good stuff under the waves. Moray eels, scorpion fish, rays, sharks, turtles and heaps of fish. We took our Advanced Open Water certificates so did some deep diving and wreck diving too. It was really hard to leave when the time came. Copan, near the Guatemala border, has some beautifully restored Mayan temples set in a luxuriant jungle environment with plenty of birdlife. The town here is right on the gringo trail which runs through this part of the world so has restaurants and bars in large numbers. We took advantage of being on the gringo trail by taking a $15 minibus service into Guatemala with about 10 other backpackers. Easy. As usual there was a mad American on board who got paranoid at the border crossing. We have come across many so called highly travelled Americans in this part of the world and each one seemed to be hiding something in their past and became very agitated at border crossings. 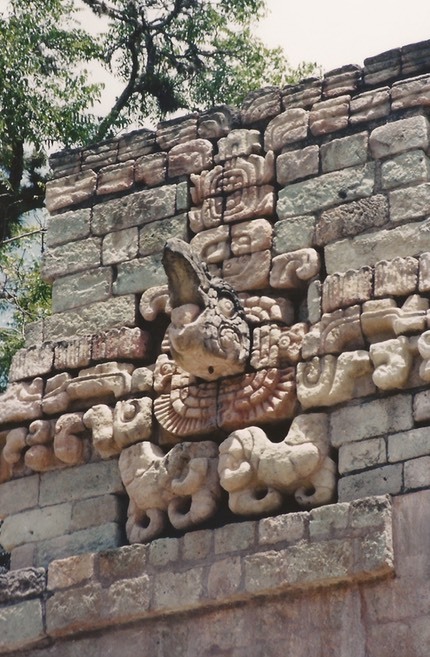 The stone carvings, being Mayan, are very similar to those in Mexico and Guatemala. 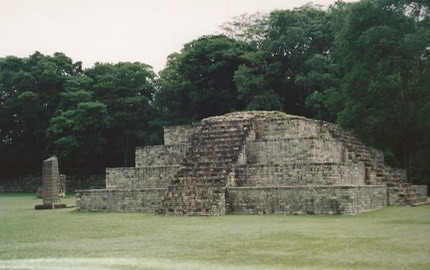 Here in Copan they have undertaken substantial restoration, as this fine example shows.